Every good room makeover needs a before, right? Well this is the before in our case. Recently our last baby bird left the nest, so we are officially empty nesters. Which meant I could move our small guest bedroom and turn it into a proper guest room. I started out by changing the paint. Because if you want to do a room makeover on a budget – paint is your best friend. For this project we chose KILZ® Complete Coat™ Paint Interior/Exterior. 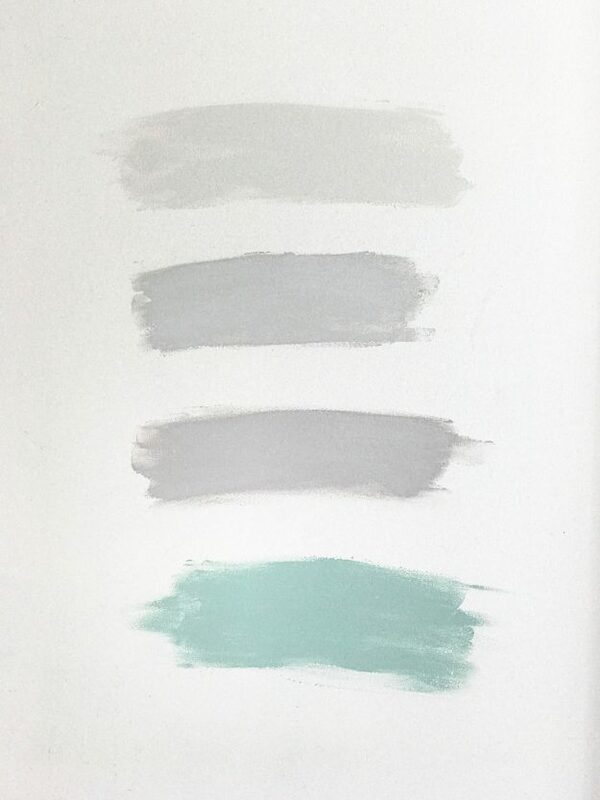 I started out by sampling a few different colors – and chose the third one down named Boardwalk. KILZ® Complete Coat™ Paint Interior/Exterior comes in 736 colors in three sheens, which is exactly why I had to sample so many. I really didn’t want to go all white here, I figured if I was going to bring in some drama, then a guest room was the perfect place to try it. We used bright white in satin for the trim and Boardwalk in eggshell for the walls. 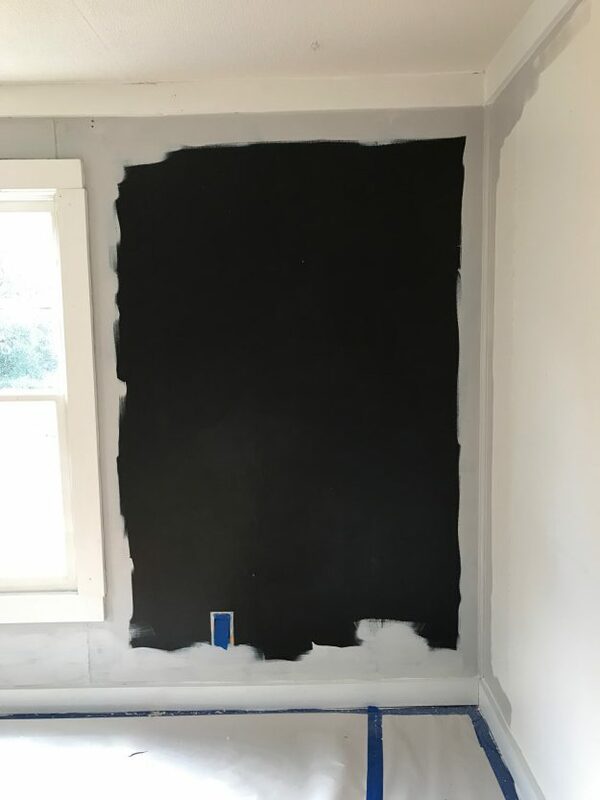 I was a bit worried about painting over the black wall because it can be a bit tricky to cover such a dark color with a lighter shade. But KILZ® Complete Coat™ Paint Interior/Exterior covered it like a champ. It only took 2 coats on the walls for complete coverage. But you want to see the after, right? The room seems so much larger with the black wall gone! The best part is: I already had all of the larger pieces. Most of the bits and pieces for the modern farmhouse bedroom makeover was purely paint & accessories. Which meant the whole shebang came in under $500! 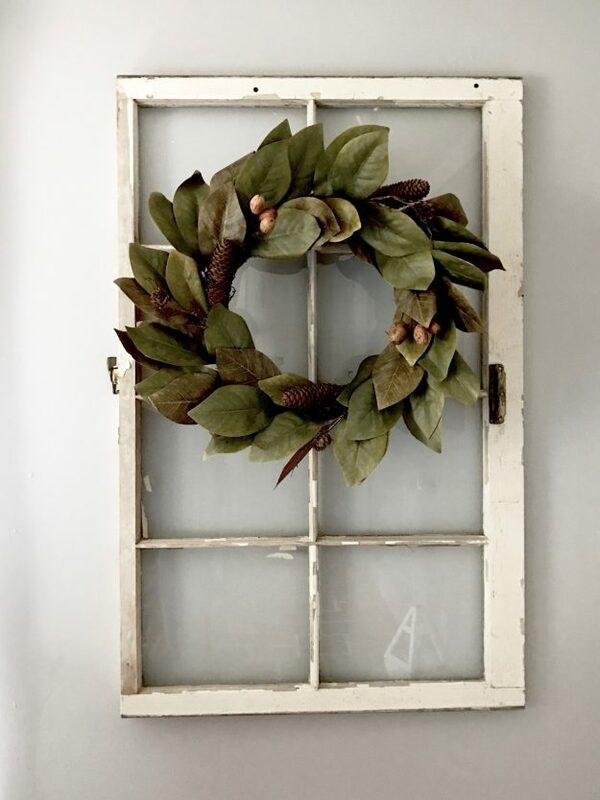 I pulled out cast off items (like this old window from the garage) and put them to good use – they worked beautifully for the modern farmhouse bedroom I was hoping to capture. Now that it’s done my girls are joking about moving back in. 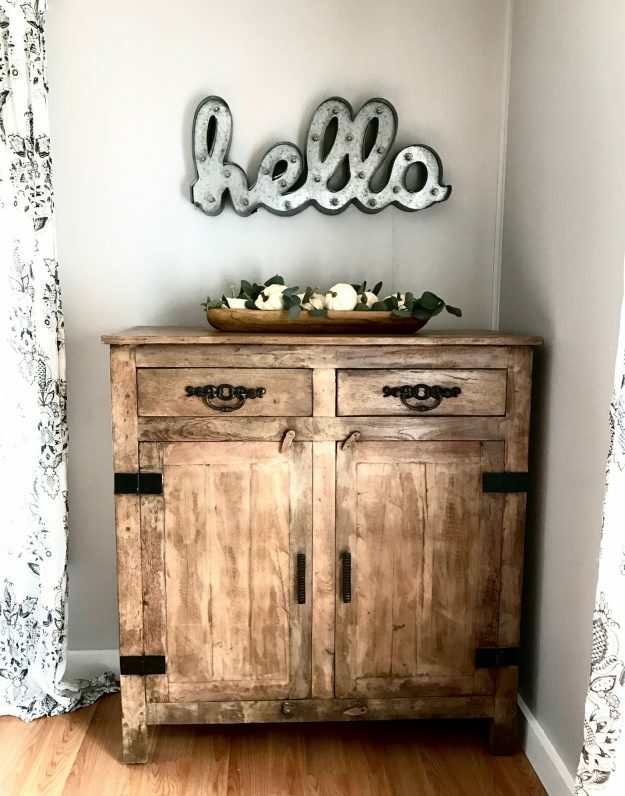 Well at least I hope they’re joking… because this modern farmhouse bedroom makeover is being put to good use soon for friends coming in to spend some time here at the cottage. Beautiful Transformation! Your guests will be comfy and at home for sure! Love this update! Where did you find the wreath on the window, it’s awesome? Wonderful! Looks great! 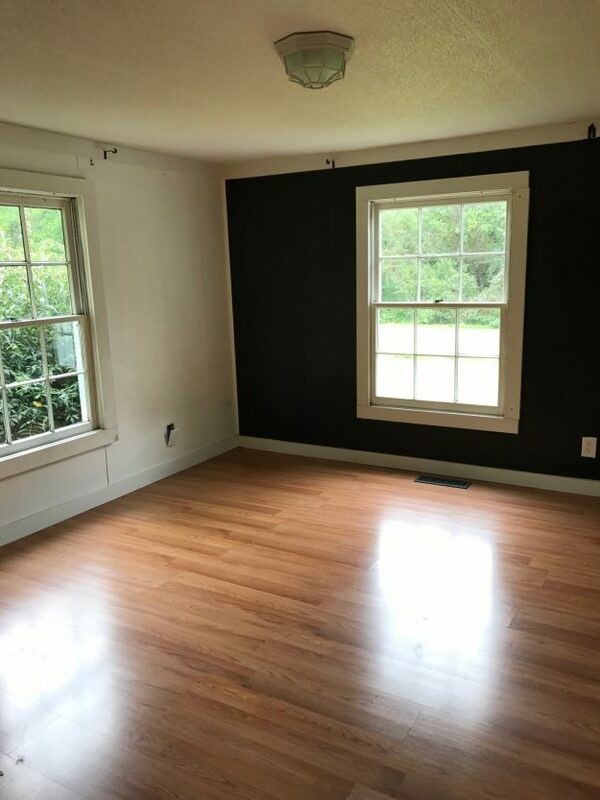 I’d like to do something similar to our daughter’s old room but the room is painted in a gloss paint, which I will never do again. Anyway, what type of paint should I use to cover over that? I really don’t want a gloss again. Thanks for your help. 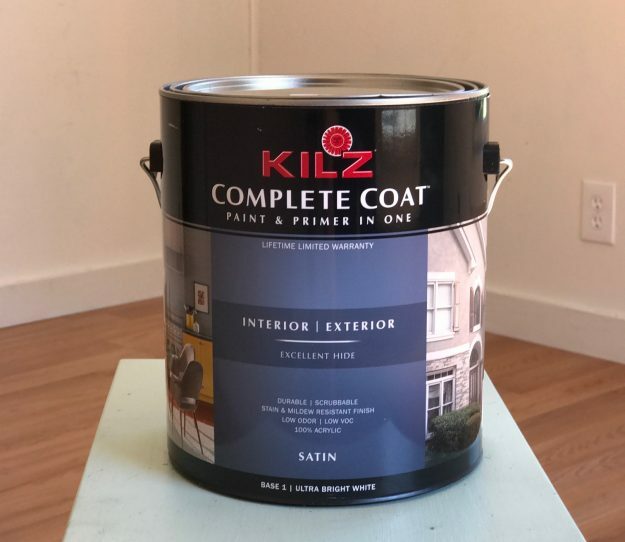 Thanks Cathy, I used KILZ® Complete Coat™ paint and primer all in one, loved it! I used an eggshell finish which isn’t glossy at all but still allows you to wipe off the walls if need be, unlike a flat. Good luck! Told him Dad, I just bought it!! He was all concerned!! We got to know each other & get even closer just by j painting! Such a sweet story Marquita, thanks for sharing!! Beautifully tranquil retreat. Good job. I would love to know this too. Love those cute little tables. Where did they come from? WOW!! Fabulous transformation. Great job! Hi Gina, It looks great! I especially love your sweet, simple fall display in the dough bowl, and pretty chandelier. Thanks for sharing! Beautiful. Thanks for the inspiration. Now I have to figure out where to start (meaning motivation). I LOVE this. so calm and pretty. I am also doing over a room adding a twin guest bed as this is my over flow mosaic studio holding mostly my sheets of glass and grinder saw cutting board so the room still has to function as my studio. BUT three times since my hubby has been gone I have needed an extra bed for guests so i found another old iron twin I painted white. I am painting the room the same color it was because I still had the paint from 8 years before and it was still fine with some serious mixing. The guest part will be small but functional. i can not tell you how many times this room has been made over and over and over. It is a tiny room at 9 by 13 foot. first was my guest room sewing room office. with several changes over the years. I am only about half way through this. Will share with you when I get it done. Bed gone from painted gold to shabby white. https://www.flickr.com/photos/50185661@N03/37217682970/in/dateposted/ Room is painted periwinkle and curtains are going to be turquoise. i need to change the tops from tab to rod pocket then I can put them up. Maybe go do that right now. Fun fun fun. LOVE your blog and Thank you for sharing it with up. Thank you so much!! It sounds like you are busy and I can’t wait to see your bedroom makeover! I hope that helps…and it is not expensive which is awesome!! Love the room! What color did you paint the ceiling…or did you? Looks awesome! Can you tell us about the window treatments? The shades and the curtains. Here are links to my curtains and shades 🙂 So glad you like them! I love your makeover Gina!! Our master bedroom has been ignored far too long. now you’ve inspired me!! Oh yea!! go for it Tanya, you won’t regret it, good luck! Excellent makeover, Gina. And what a bargain! I always learning about color, would have never thought the Boardwalk shade would look this terrific. I often like black walls (don’t laugh), but here painting out the black is a bit like taking off too-tight shoes. What a relief. My favorite bit is certainly the small cabinet,that’s really the best of farmhouse. One thing tho’; the chandelier is gorgeous and a perfect contrast to the other more rustic pieces, but what if your guests want to read in bed? Congratulations on the great, and very practical, blog! Thanks for sharing! So pretty!! Love the transformation. 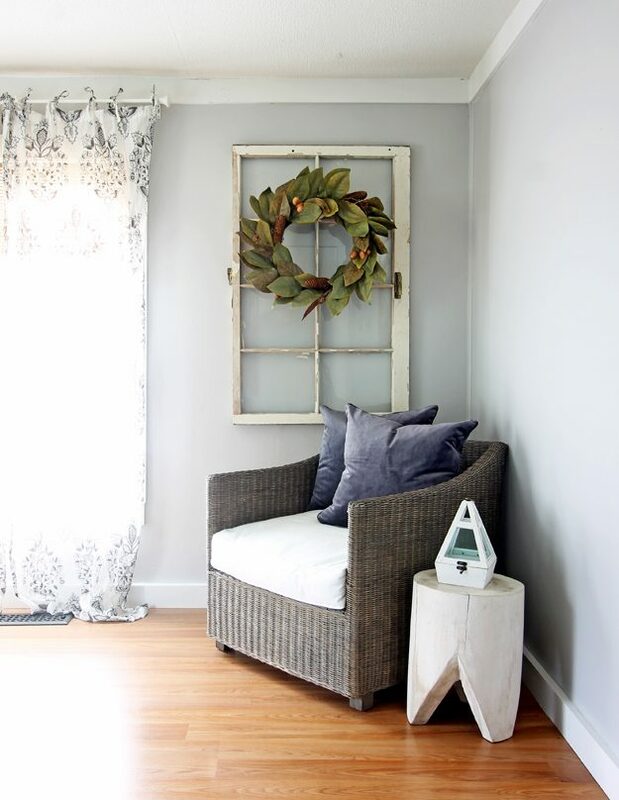 Farmhouse style is just so clean and comfy. Excellent job. 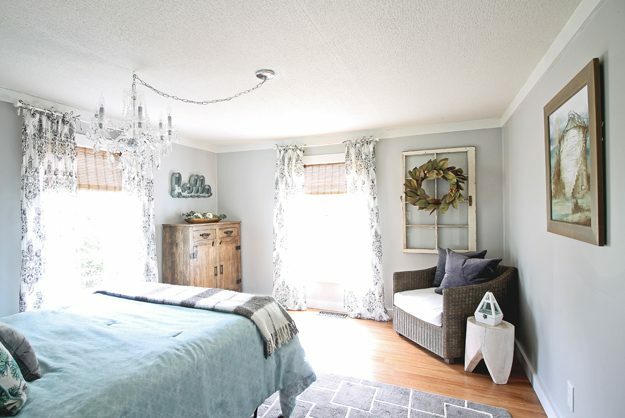 So light and airy….just beautiful….great job on the guest room makeover. What a beautiful transformation, Gina! I Love the paint color you chose! Your guest room looks beautiful.I love the colors! Gorgeous! Come and do mine please. Lol. LOL, thanks so much Michelle!! It’s so calm and peaceful. I just love it. You’re right. Without the black wall it looks so much bigger. Where do you buy your blinds. Love the look. Where is that great wood cabinet from? 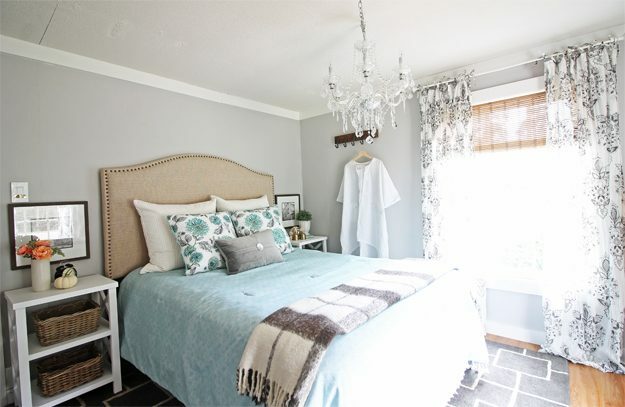 Absolutely love the guest room redo! I also didn’t know Kilz came in colors. Great job! Thanks Peggy! I didn’t either and was thrilled with the results!! Love the bedding. Are you willing to share your source? Beautiful, relaxing room. Beautiful guest nest! Well done. Thank you Cheryl, You are so sweet! You are so sweet! Thanks so much Roseanne, Happy Holidays to you too! Ha ha, I’ll be right over 🙂 Thanks so much Kay! Hi Gina! Very cute room!! I’m not sure if you posted it, but what color is your ceiling? It doesn’t look white. Thanks!! Love everything in the room! Where did you get the headboard? Thanks Ann, Happy New Year!! Where did you find the white open shelf night stand? Love the makeover. Was the blanket, at the foot of the bed, from Home Goods also? Great job! Super cute and inviting! Love how it all turned out. You created a beautiful serene room any guest would lucky to stay in.